Low level laser therapy (LLLT) is a medical procedure used to treat pain and speed up wound healing. This treatment uses low-level lasers to alter the healing process at a cellular level. While it is not exactly clear how low-level laser therapy works, it is thought to diminish inflammation by reducing the number of cellular chemicals and enzymes linked to pain and inflammation. Another mechanism may be related to the stimulation of the cells to increase the production of certain enzymes which affect cell proliferation or cell division, thus increasing the healing speed of a wound. The effects of low-level laser therapy appear to be linked to the specific wavelength of the laser treatment itself. The ideal wavelength, or dosage, duration and location of treatment is specific to each ailment and wound. Research demonstrates that administrating low-level laser therapy below the dose range does not appear to be effective. The effective clinical dosage of low-level laser therapy varies by manufacturer and remains a subject of continued research. During low-level laser treatment, a laser device is held next to or directly on the body for a specified amount of time. If held directly on the body, a small plate will be placed between the laser and the surface of the skin, creating a gap of approximately two millimeters. During the treatment, a specific wavelength of light is emitted and pulsates. The treatment dose, which includes duration, pulse rate and wavelength, reflects common clinical guidelines created by the manufacturer of the low-level laser. Most individuals report no sensation from the laser treatment. Prior to application of a low-level laser, the body area is prepared by cleaning and shaving skin. Both the recipient and the administrator of the low-level laser treatment wear goggles to prevent light detection from the laser. Because the laser is small, it is able to pinpoint areas of the body that other treatments may not be able to reach. Additionally, it is considered a pain-free and non-invasive treatment, whereas other treatments may be painful and laborious to complete. Perhaps most importantly, low-level laser therapy allows access to a wound or painful site without causing damage to any of the surrounding tissue. While low-level laser therapy is now widely used, the FDA has reviewed the evidence for low-level laser therapy and still considers it an experimental treatment. Many major insurance companies agree with the FDA's view, which directly impacts the treatment cost to the consumer. In some research cases, the efficacy of this treatment is considered questionable or invalid. It should be taken into account that knowing and using the correct dosage of low-level laser treatment is imperative to the success of the treatment. Methods for determining the correct dosage remains an ongoing topic of research. 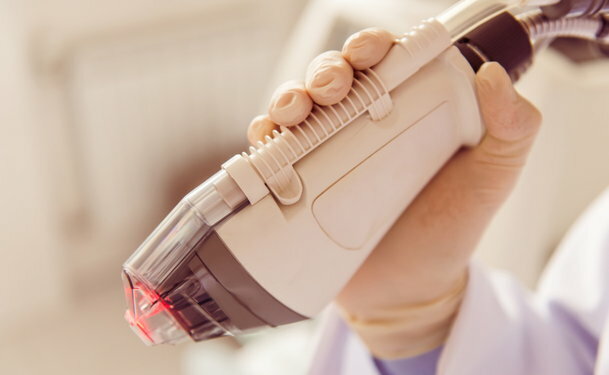 Independent research studies have arrived at different conclusions regarding the effectiveness of using low-level laser therapy to speed wound healing. This is likely due to the vast wound variance used in the studies themselves (ranging from acute, surgical to chronic ulcerations). Regardless of the efficacy of the treatment, low-level laser treatment is considered a safe alternative to other more invasive procedures, which can cause harm to the surrounding tissue or to the site itself.